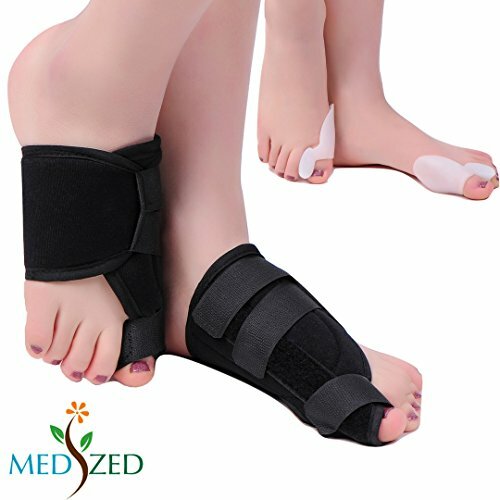 HIGH QUALITY BUNION & HALLUX VALGUS RELIEF KIT. The pack comes with 2 Pairs (4 PCs) of good quality Bunion Relief KIT that includes Bunion Splint Brace and Gel Toe Separator & Bunion Guard. BUNION SPLINT BRACE: Night time or Daytime (while you are at home) bunion splints provide padding and moderate realignment of your bunions. They provide adjustable realignment to help keep your big toe straight and relieve your nighttime bunion pain. GEL TOE SEPARATOR & BUNION GUARD :This Quality Gel Toe Separator and Bunion Guard is ideal when you have an irritated bunion and you have to wear tight shoes. It can absorb the shoe pressure and friction. Our Quality Toe Separators and Bunion Pads increases space between the big toe and second toe for proper joint alignment and less irritation and friction in shoes. These are highly recommended Bunion Splint. Choose either left or right brace as needed. The longest section with the single strap should be placed under your big toe. 1. Open all straps and lay brace flat. Rough side of straps will face up. 2. Place section with single strap under big toe. Place foot flat on brace. 3. Pull single strap up between large and second toe. Leave strap loose. 4. Fold small section on inside of foot over top of foot. 5. Wrap larger section that is on outside of foot over the smaller section. 6. Secure with two straps. 7. Lastly secure single strap between your toes to the main brace. 8. Adjust straps until brace is secure and comfortable. If you have any questions about this product by MEDIZED, contact us by completing and submitting the form below. If you are looking for a specif part number, please include it with your message.